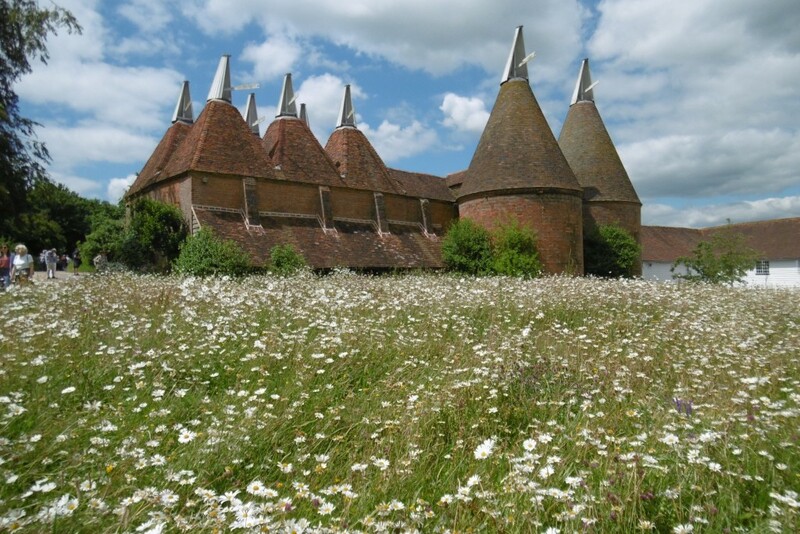 A group of tall pyramidal kilns topped by white cowls, visible across the landscape is the classic image of a hop oast. Yet it is not at all clear when, where and how the idea of building a tall pyramidal square kiln, seperate from the stowage with its lower roof profile, took hold. The driving force was the realisation that the higher the vent above the drying floor, the better the draught drawn up through the drying hops. It is unlikely that examples of the tall kiln as we know it today had been built by the beginning of the 18th Century. By the end of the 18th Century some large oasts with full scale tall kilns alongside the stowage were being built in the format that would prevail well into the 20th Century. 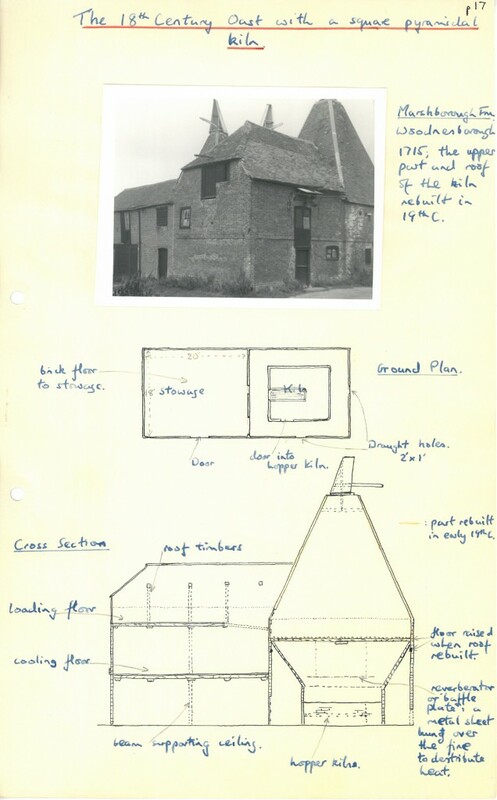 In my 1960 survey I reckoned that I had found only a handful with pyramidal kilns dating from the 18th Century. In so far as a few oasts had dated bricks, these are always on the stowage, leaving open the question whether the stowage and the attached kilns were built at different times. The pyramidal kiln roof, whether square or round, appears to have evolved upwards from small kilns projecting above the roof of the stowage in the first instance. The construction of an inverted pyramid ceiling of the kiln up to the vent must have gone hand in hand with the raising of the height of the roof. 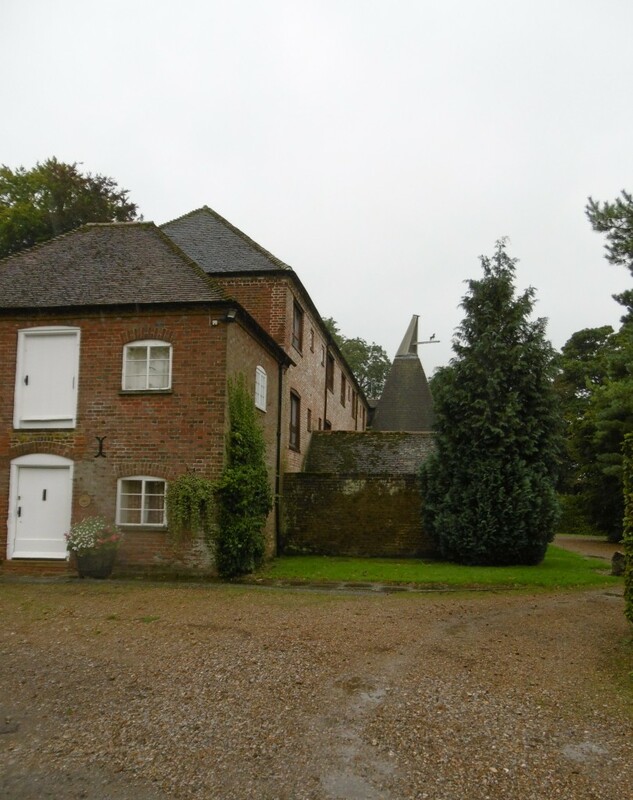 Marshborough Farm at Woodnesborough near Sandwich, East Kent is an 18th Century building with a fully formed square pyramidal kiln. The walls include a dated brick, 1715. But was the three storey stowage built in the first instance for hop drying and was the kiln added later? 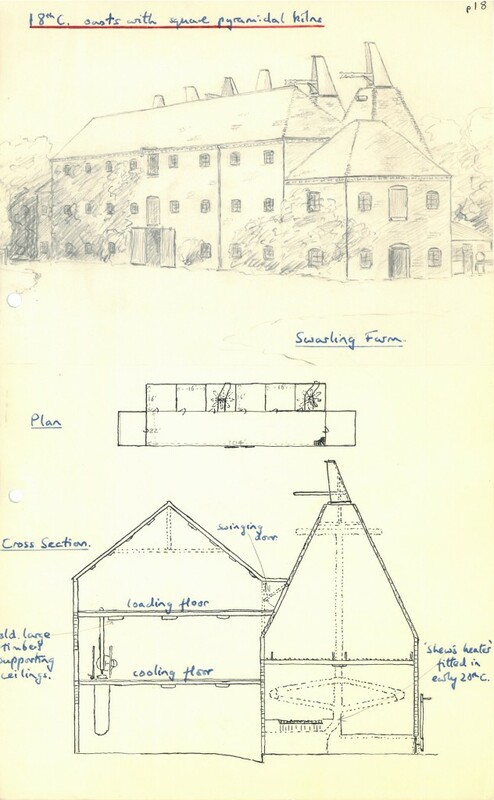 Marshborough is also significant in that the interior with its 19thC plenum chamber of the kiln, as shown in my 1960 drawing, has remained virtually untouched since. 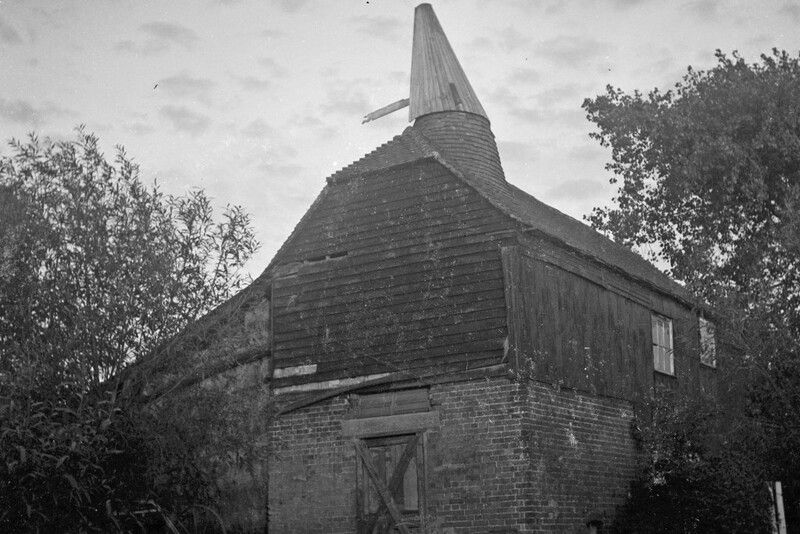 The oast at Swarling Manor, Petham, SW of Canterbury is dated 1790 and was still in use in 1960, though operations ended 5 years later. It had a three storey stowage allowing for separate loading and cooling floors and 6 large square kilns. Each kiln had a Shew’s Patent Pure Air Heater installed early in the 20th Century, as shown in outline in my diagram. An enclosed steel furnace and system of pipes curved around the kilns,heating the chamber but preventing fumes getting near the hops. The kilns were severely damaged in a storm in the 1987 and 5 of them were demolished, as the modern photograph shows. At Sissinghurst Castle a set of 6 square kilns from the late 18thC has survived well through the care of the Sackville West/Nicolson family and now the National Trust. Each kiln is unusually squat and 12 foot square. 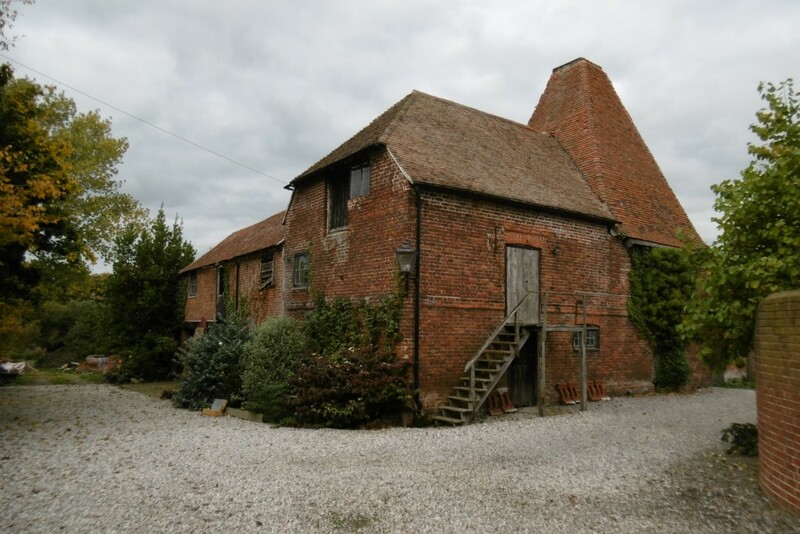 They must have drawn the draught much less well than the neighbouring typical tall roundals, built in the later 19th C. Hop drying continued until 1967 but the interiors of the original 18thC kilns has been taken out and replaced with modern machinery.